Tis the season for vibrant colors and fresh ingredients. 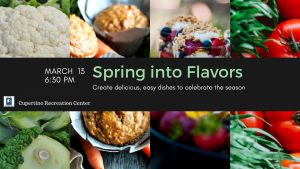 In this workshop, we’ll make 3 simple, delicious, and healthy dishes that incorporate the flavors of the season and are bound to put some spring in your step. All attendees will make and take home all 3 dishes. All diets/preferences can be accommodated. Register thru the Cupertino Recreation Center. Class fee: $40 (members)/$48 (non-members).